The Dart Systems PipeDart Mini range of Cobra / Duct Rods are available fitted with 4.5mm Diameter Rod. Manufactured by Dart Systems these Cobra Rods are designed to be rugged and long lasting. 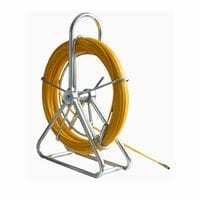 A tough compact flexi duct rod system which solves the problems associated with cabling over longer distances. 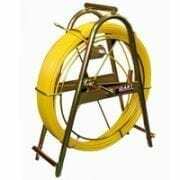 The PipeDart is a frame mounted cable pulling system manufactured from 4mm Diameter Composite Fibreglass Rod, also known as Cobra Rod or Duct Rod. The Steel Cage can be separated easily from the frame to allow for ease of handling / storage. 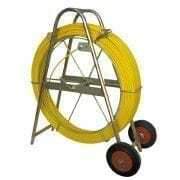 The construction of this product allows for fast feed out and rewind and solves the problem of cabling over longer distances. Ideal for wiring of multi-storey office complexes, shopping malls and industrial sectors. Fibreglass sheathed with Polypropylene for durability and wear resistance. Supplied complete with Guide Tip. 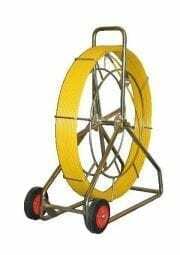 The Dart Systems PipeDart Large range of Cobra / Duct Rods are available fitted with 11mm Diameter Rod and are supplied complete with Wheel sets for ease of transportation. Manufactured by Dart Systems these Cobra Rods are designed to be rugged and long lasting. The Dart Systems PipeDart Compact range of Cobra Rod / Duct Rods are available fitted with 9mm Diameter Rod and are supplied complete with Wheel sets for ease of transportation. Manufactured by Dart Systems these Cobra Rods are designed to be rugged and long lasting. The Dart Systems PipeDart Ferret range of Cobra / Duct Rods are available fitted with 6mm Diameter Rod. Manufactured by Dart Systems these Cobra Rods are designed to be rugged and long lasting.